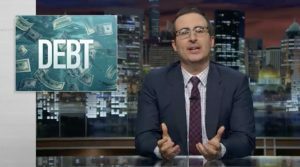 PENSACOLA, FL — When high school student Samir Boussarhane watched Last Week Tonight as John Oliver triumphantly donate a $15 million medical debt portfolio to RIP Medical Debt, so the debt could be forgiven, Samir knew he had to do something locally to make that kind of impact. He approached Joshua Williams and Falen McClellan, two fellow 16-year-old students in the International Baccalaureate (IB) program at Pensacola High School. The IB program requires a Community Development Project (CDP) with Creative, Action and Service (CAS) elements. The three decided to fulfill their duty by duplicating — if modestly — John Oliver’s feat of buying and abolishing medical debt. The first step was to call RIP’s CEO, Craig Antico, to get the charity’s permission and some pointers on how their project could be done. They soon launched a DebtSharks website and a GoFundMe campaign with the goal of raising $10,000 for RIP to buy and abolish $1 million in medical debt for people in the Pensacola/Mobile area. They also launched a Twitter feed (@DebtSharks) and a Facebook page to explain their program, and they announced a public fundraiser — “Spirit Night” — held Monday evening, January 16, at Chubby’s Pizza N Wings. The restaurant owners, Jamie and Stacey Rigdorn, enthusiastically supported the effort. “We are doing our own promotions,” Samir says. “We pass out flyers, talk to local businesses and use word-of-mouth with social media to get out the word. People can text DebtSharks at ‘41444’ with the amount of their donation and their names. “They’ve reached out to local newspapers and TV news. The Debt Sharks are a tenth of the way to their goal. In late January, Samir reported having raised enough money for RIP to forgive $105,000 worth of Pensacola-area medical debt. The fundraising continues.